Home > Law Books > Other > School Law Guidebook, 2017 ed. School Law Guidebook, 2017 ed. 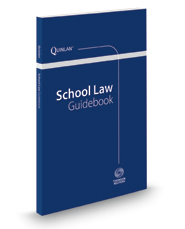 This guidebook serves as a resource in determining what steps are appropriate when faced with challenging situations that involve student or teacher rights. You'll find checklists to help you determine what level of due process and duty of care are required.